The Pacific NorthWest Economic Region offers a wide range of Sponsorship Opportunities to public and private sector organizations interested in leading the Pacific Northwest forward. These opportunities range from a simple membership, to presenting sponsorships of our highly visible Annual Summit, and many areas in-between. PNWER has opportunities available to support the 2019 Annual Summit in Saskatoon, Economic Leadership Forum in Seattle or specific programs like our Arctic Caucus or Regional Resilience initiatives. Sustaining Sponsor: Make your sponsorship dollars go further with a sustaining sponsorship! 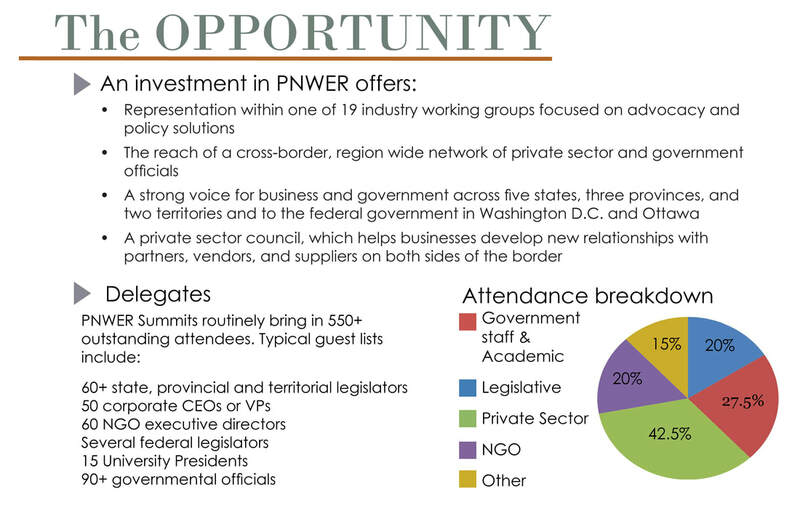 Make a three year or more commitment to any level of Annual Summit sponsorship and receive the recognition and benefits of sponsorship at all PNWER events throughout the year, including the Annual Summit, Economic Leadership Forum, and Arctic Caucus. More information here. Annual Summit Sponsor: The PNWER Annual Summit brings together over 500 key business leaders, legislators, and government leaders from PNWER's ten states, provinces, and territories to address the major policy issues impacting the region. Economic Leadership Forum Sponsor: The Economic Leadership Forum is an opportunity for regional business leaders, legislators, and government leaders to take action on the issues impacting the region. Building on the work at the Annual Summit, the Economic Leadership Forum brings together over 100 participants to focus more intently on the big issues effecting the economy of our region. This event is more intimate then the Summit and allows for more interaction and focus with participants. Invitation to join our working group calls planning for the winter meeting and Annual Summit.